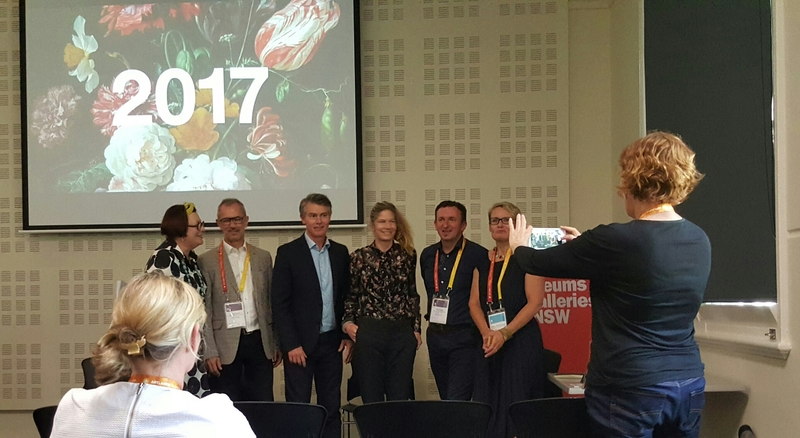 Jennifer Barrett, M&G NSW Chair, AGNSW Director Michael Brand, Steven Alderton, Australian Museum, MAAS Director Dolla Merrillees, Blair French from the Museum of Contemporary Art, Caroline Butler- Bowden from Sydney Living Museums. Image courtesy of Susan Charlton. Right around Australia ARTLANDS 2016 delegates are debating and talking about ideas, projects partnerships and performances that formed the basis of the hugely successful regional arts conference recently held in Dubbo. An estimated 600 delegates assembled to hear a range of national and international keynote speakers, expert panels, facilitated forums, workshops and discussions built around three key conference themes – that of Regeneration, Connectedness and Emergence. They were used to describe big picture thinking in the regional arts sector today. Each theme was explored through contemporary issues aired, challenges faced and opportunities presented. Arguments and presentations brought to life research, exploration and debate, and sector-wide collaborative practices employed. ARTLANDS also included a strong festival program, and for me the performance by Buried Country was a highlight. Country music and Indigenous culture may seem an unlikely pair, but for Indigenous Australians it makes sense, with storytelling and the recurrent themes of lost love, the land, and mother, all connected to experiences shared. M&G NSW contributed to the main conference program through the organisation of a panel discussion titled Outward Bound which featured, MAAS Director Dolla Merrillees, AGNSW Director Michael Brand, Caroline Butler- Bowden from Sydney Living Museums, Blair French from the Museum of Contemporary Art – Australia and Steven Alderton from the Australian Museum. It focused on providing delegates with an overview of community engagement strategies and programs run by the institutions represented. Outreach provided by our major cultural institutions was once the domain of touring exhibitions and object loans with a sprinkling of distance advisory support thrown in. While these remain important and active concerns, thinking has evolved. Increasingly the big end of town wants to listen, learn and demonstrate how they can better know and support audiences and communities in Western Sydney, regional centres and the more the remote parts of NSW. In an article for Arts Hub, Gina Fairley identified perhaps the most salient of panel discussions held, and unfortunately I missed it! Fortunately Gina’s excellent piece captured the essence of a discussion shared between Lindy Hume, Wesley Enoch and Mat Trinca that, to quote Hume ‘regional Australia needs to undergo a huge re-branding exercise’. And in response, Trinca nailed it ‘so often when we talk about “the regional” it’s a way of saying what we are not – not the city, not urban, not national. It is a fairly monolithic idea. Rather, I am moved by the idea of the local – it doesn’t matter whether local is here in Dubbo, in Western Sydney or Surry Hills. What distinguishes the local is a sense of community and a sense of effective face-to-face relationships’. In a rather timely intervention towards the end of the discussion, particularly in light of the recent publication of the National Opera Review which calls for an additional $24 million injection into our major opera companies (commissioned by George Brandis of course), Enoch suggested ‘Why don’t we look at graduating some of the majors from public funding all together, and give that funding to the regionals. Imagine if we transferred $2 million (let alone 24) – putting that kind of resource into a regional company would create a totally different paradigm’, and so we should.